Figure 1. 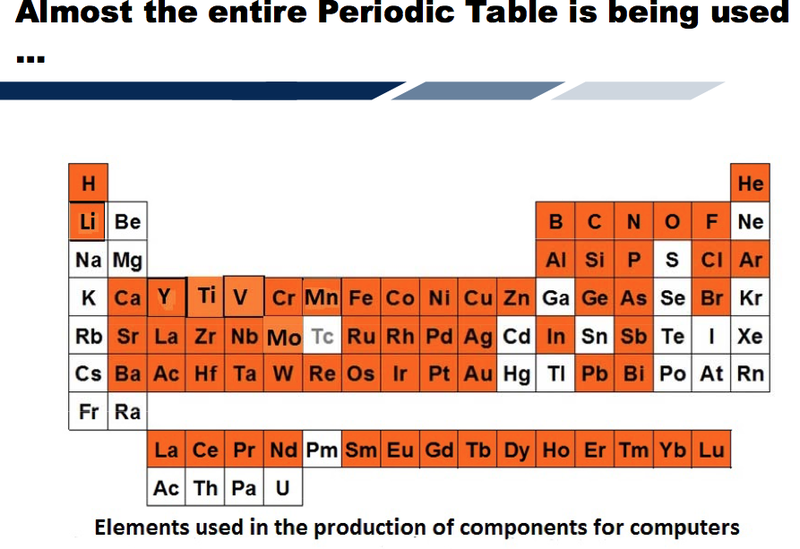 Slide from presentation by Alicia Valero at UNED energy conference showing that almost the entire periodic table of elements is used for computers. Figure 2. 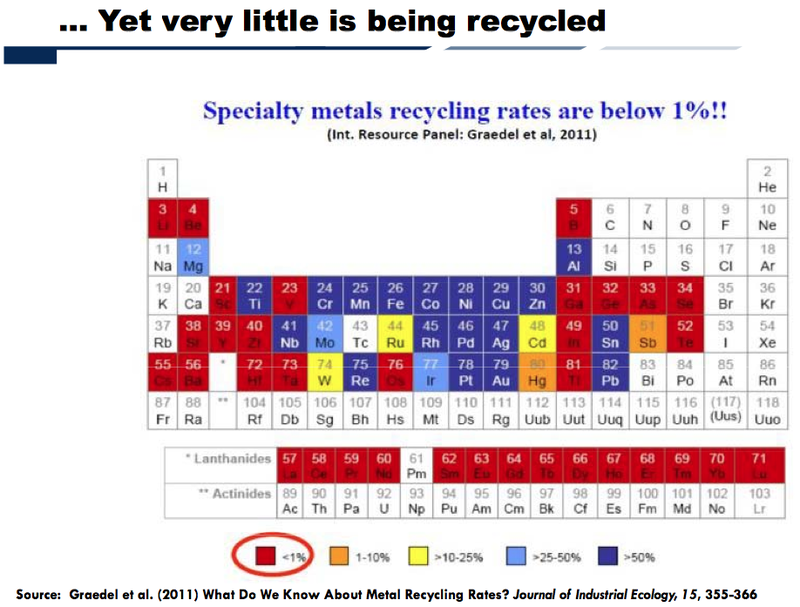 Slide from presentation by Alicia Valero at UNED energy conference showing recycling rates of elements. Figure 3. 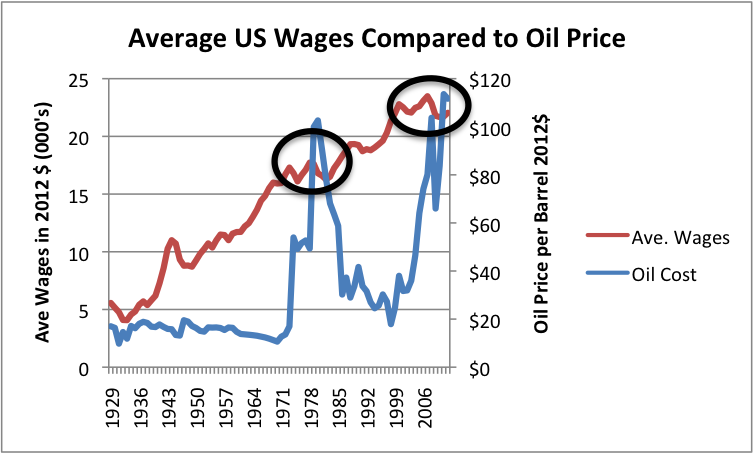 Average wages in 2012$ compared to Brent oil price, also in 2012$. Average wages are total wages based on BEA data adjusted by the CPI-Urban, divided total population. Thus, they reflect changes in the proportion of population employed as well as wage levels. 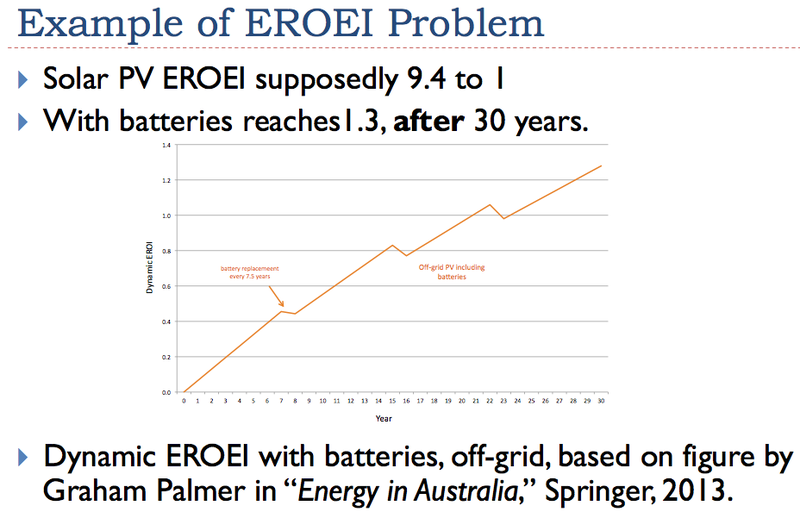 This entry was posted in Alternatives to Oil, Energy policy, Financial Implications and tagged electric grid, EROEI, green energy, oil prices, renewables, solar PV, wind energy. Bookmark the permalink. I have a new post ready, but I am going to wait until Sunday evening to put it up. With everyone very busy over the weekends leading up to Christmas, not many will have time to read a post during the weekend, and I won’t have much time to respond. Here is a ‘green solution’ which may illustrate some of the opportunities and issues in the field of food. This is from the excellent book Eat Your Greens by David Kennedy. Kennedy has many very practical ways to increase the harvested human nutrition from green leaves, which are the magical vehicles which create food out of air and water and sunshine. The issues which must be dealt with are also covered in the book. While the straightforward way to maximize nutrition is to simply eat the leaves, and while most of our primate cousins would do just that, the human gut is not designed to subsist on a diet of green leaves. If we don’t eat ANY green leaves, which most Americans don’t, we will have all sorts of chronic diseases. But we can’t very well eat 20 pounds per day of green leaves, as a gorilla might do. The issue, then, for humans is how to get some concentrated calories. At the present time, we get them overwhelmingly from seeds (e.g., corn, wheat, soybeans, rice, etc.) and roots and tubers (potatoes, sweet potatoes, yams, etc.). David Kennedy covers two methods for turning green leaves directly into more calorie dense food. The first is drying and grinding, which can be accomplished by a solar dryer and hand grinding, in the simplest case, and industrial drying and industrial grinding and incorporation into industrial, packaged food in the most complex case. The second method is the production of a leaf concentrate by a process of juicing and making curd and then using or preserving the curd. Kennedy thinks that making concentrate is good therapy, but believes it is best done at the industrial scale. The first thing to notice is those things which are probably NOT limiting factors. Cowpeas host the bacteria which fix nitrogen, so a lack of industrial nitrogen is NOT an issue. If green leaves are our source of calories as opposed to the seeds, we can grow 9 times more calories on the same land used to produce the black-eyed peas. So calories and protein and micro-nutrients are NOT the critical issue. The refusal of most people to eat what they need to eat MIGHT be the most pressing problem. So, let’s suppose that we want to make a solar dryer and grind some leaves. My daughter made a solar dryer out of a salvaged paper towel dispenser and disposal receptacle. Broadly, we need some industrial detritus to make most solar dryers. Direct exposure to the sun is NOT a good idea. So we need some rather simple infrastructure in a shaded spot. Grinding used to be accomplished by women using two rocks and lots of repetitive motion. The result was women with back problems and teeth which were ground down by small particles of rock. I have, in previous comments, tried to make the point that the survival of modest sections of the industrial world will be a very big help…referring to the Pareto Principle that 20 percent of anything generates 80 percent of the value, and sometimes its more like 10 and 90. At any rate, I hope this helps to clarify some of the issues which will become apparent as we descend the energy curve. I’ll also refer back to Kelly McGonigal’s TED talk where she apologized for demonizing stress. It turns out that some people thrive under stress. I was watching an Ingmar Bergman movie about the frustrations of the human condition, thinking that he was under the stress of both making movies and his complicated personal life, and how he lived to be 87 (I think). My homemade conclusion is that the stress of creating something, overcoming obstacles, is not at all like a helpless rat in a cage getting random shocks. That’s one of the reasons I promote the idea that a family should produce some of the essentials that it needs…as opposed to being utterly reliant on something called ‘the market’. Better to wrestle with the cabbage loopers than the Federal Reserve or the idiots in the House of Representatives passing war resolutions about Russia. Let’s suppose that I am correct in dividing stress into two different categories: one destroys health while the other is a creative response to the challenges of life. Then what does a statistical study of ‘stress’ actually tell you? As for the gut bacteria. (Full disclosure. An in-law of mine is a gut bacteria researcher.) It seems to me that the crucial issue may be ‘leaky gut’. That is, chemicals in the food we eat is getting into the body proper through the gut lining when it should not be. The great increase in the production of Frankenfoods might lead us to think along those lines. Whether the movement of Frankenfoods across the gut lining is a function of bad bacteria or some more mechanical malfunction, I simply don’t know. Here is a scenario which could result in a massive reduction in population very quickly. According to George Mobus, perhaps one third of the world’s people have dormant TB bacteria. About 10 percent of the infected people will develop TB. But among those who have HIV compromised immune systems, 30 percent will develop TB. We also know that TB is increasingly drug resistant, and that treating TB requires the functioning of a modern health care system. Now assume that the events you prophesy happen, and the modern health care system collapses and the global food system collapses. The collapse of the global food system will compromise immune systems just as surely as HIV will do so. So we have 3 billion people with dormant TB. They are overwhelmingly in poor parts of the world. Many are crowded into third world supercities. TB is highly infectious. So perhaps we have about a billion people who are currently infected but not active, who become active as they develop compromised immune systems. These billion infect other people, who also have compromised immune systems. Before you know it, you are talking about serious numbers of deaths. Are there any alternatives? Well…the governments could take the land held by the multinationals to grow crops to ship to the rich countries and distribute it to poor people. The poor people could implement the gardening strategies outlined by David Kennedy for growing greens in both the tropics and the temperate zone. Leafy greens are the immune boosters par excellance. The new farmers would face many challenges, not the least of which is adjusted expectations. Many of them would probably go right back into the cities, just as people left rural England for the pestilences of London. Another alternative is that governments react calmly as the inevitability of decline becomes apparent. The governments engage in triage, and manage to save public health services and also to increase the amount of leafy greens people eat in order to boost immunity. (I have heard that if everyone in the US tried to eat the My Plate recommendation for fresh fruit and vegetables, only 3 percent of the population could be accommodated.) The only realistic way to boost greens consumption is to multiply home gardens by a large factor. Mathematics says it can be done, but, just as with the poverty stricken people in Asian and African cities, the psychological adjustment would be severe. PS There are, of course, other reasons why people might die besides TB. Good advice Don Just wondering – am I the only one collecting a supply of heritage seeds? Are you planting them out and keeping the resulting seed? Some seeds (notably, beans and pulses) don’t last more than a year or two, while others can go many times as long. We don’t know how things will end, but we do know that epidemics have been involved in a lot of population reductions in the past. We in the West seem to think that doctors can cure almost every disease, but that really isn’t the case, especially if immunity is compromised for some reason. If population declines, it would not be surprising if diseases play a major role. President Vladimir V. Putin of Russia announced today that Russia is dropping plans for the South Stream pipeline and instead will expand a pipeline through Turkey. “It was a rare diplomatic defeat for Mr. Putin, who said Russia would redirect the pipeline to Turkey. He painted the failure to build the pipeline as a loss for Europe and blamed Brussels for its intransigence. “From South Stream to “Turk Stream” Pipeline: Huge Win for Turkey, Big Win For Russia, Historic Loss for EU. I didn’t notice any reference to currencies in above articles; I guess it won’t be in USD. That’s one way to look at it. Another is that Turkey then becomes the major hub supplier of natural gas to Europe via pipelines and tankers. The premium its customers will pay will enrichen Turkey and keep Europe from catastrophe. Russia, Turkey, Europe everybody still wins. The behavior of Europe relative to North Stream and South Stream has never made any sense to me. Perhaps one of you can explain. Russia obviously wanted to get their distribution pipes to western Europe without subjecting them to the treatment that might very well be inflicted by Poland and Ukraine. So North Stream was built through the Baltic and South Stream was to have been built through the Black Sea. If I lived in western Europe, I would be quite alarmed if my gas was coming through Ukraine…a very unstable country with a history of larceny. Why anyone in Europe would think that preventing Russia from building a more secure distribution network is somehow a ‘victory’ for Europe is a mystery to me. It seems that Russia is simply taking the gas that used to go to Europe and rerouting it to China and Turkey. It costs them some money, but it is better than dealing with the irrational leaders in Brussels. We are certainly succeeding in driving Russia into the Asian camp. Why? Because they want to rule the world. I have no better explanation than yours, and I think “the irrational leaders in Brussels” are playing a very dangerous game, but maybe they have no other choice? “Washington’s puppet rulers of Europe are the enablers of the neoconservative war-mongers. In all of Europe there is not a government independent of Washington. Pawns like Merkel, Cameron, and Hollande are selling out human life. Bulgaria loses half a billion dollars per year in transit fees because of the new deal. Their euro sceptics are very unhappy about this, they say that the EU and the US has used them as geopolitical pawns. Perhaps Bulgarians will begin to rethink the benefits of EU membership. East-West tensions tend to put strains on the border countries. The chairman of Bulgaria’s Attack party blames the United States and the European Union for using Bulgaria as a pawn in geopolitical games against Russia. He states that Sofia had to terminate the construction of the South Stream pipeline under Washington’s pressure. MOSCOW, December 4 (Sputnik) — Bulgaria could lose 400 million euro ($492 million) per year from closure of the South Stream gas pipeline as Washington and Brussels use the country as a “pawn,” the chairman of Bulgaria’s Attack party Volen Siderov told Sputnik on Thursday. “Supine submission to Brussels and Washington leads to no good. As a result of this policy Bulgaria could lose 400 million euro per year,” Siderov told Sputnik in an interview. Siderov told the agency that several months ago, Bulgaria received “a warning” from the US ambassador to the country and a delegation of senators led by John McCain. The country’s then Prime Minister Plamen Oresharski was “literally forced to terminate the construction of the South Stream. Bulgaria obeyed,” the politician said. You are right–this can be interpreted many different ways. I am not sure anyone is will come out well in the years ahead, but dropping plans for the South Stream pipeline makes it less likely that Europe will come out well. We will have to wait and see. Turkey is a member of NATO and so sending oil to Turkey is a way for all sides to save face. The Ukraine Problem is bypassed, Russia gets access to the stable markets of Europe via the pipeline network Turkey-Bulgaria-Eastern Europe, Europe gets the gas it needs, Turkey gets all sorts of benefit. This is a rational decision and underscores the FACT that these are rational actors acting in self interest NOT some apocalyptic End Game. Another perspective, the EU and Russia are increasingly hostile and Putin is weakening EU unity by diverting the gas to Turkey. Finally, the third group of countries are those who will suffer most and directly, Bulgaria and Serbia above all. Bulgaria will lose the $750 mln a year it could gain from gas transit. For Bulgaria, who entered the EC trap a moderately developed country- exporter of fruits, vegetables, wine and certain types of machinery to Russia and neighboring countries and just a decade after breathing “the air of liberty” has become a net importer of fruits and vegetables, a poverty-stricken third world country with the unemployment over 20% (in the previously industrial North, unemployment reaches 60%), and with the population that dwindled from 9 million to 7 million in just seven years, $750 mln a year is an astronomic sum. Serbia wanted Russian gas so badly that it even revolted against the EC sanctions on Russia and now accuses Putin of almost a treachery. Serbian losses from the South Stream stoppage look really serious, even more serious than Bulgarian ones: $500 mln for transit, thousands of lost working places, about $5 bln of direct and indirect investment losses… But let’s not forget that this same Serbia refused to sign a final agreement on South Stream during Putin’s visit to Beograd in October 2014. Yes, Serbia resisted EC sanctions on Russia- but let’s be honest, Brussels did not press it too hard knowing very well that the “key country” is Bulgaria and knowing also that the political elite of this country will do anything Washington and Brussels order. There was simply no need to pressure Serbia too hard. So now there are no triumphing cries in the Bulgarian and Serbian media; Russia will not be in Bulgaria and Serbia- but instead, it will be Turkey, who happily agreed to host the alternative route of the South Stream, with a gas hub on its borders with the EC. And Russia explained its position very clear: if you guys want to see the South Stream passing through your countries – YOU go to Brussels and put your cards on the table. With this move Russia has driven a very big nail into the “European unity”, and I shall not be surprised if Bulgaria, Hungary and Serbia join Britain in leaving the EC. Russia does in Europe what Europe and the US did in Ukraine and planned to do in Russia: splitting and weakening. And if it happens, Europe will not have the right to cry and complain: what you sow, you shall mow. > I shall not be surprised if Bulgaria, Hungary and Serbia join Britain in leaving the EC. EC or EU? Britain has not left the EU. Serbia was never a member – it is however a candidate country to join the EU. Candidate countries have applied to the EU and been accepted in principle. When they will actually join the EU (if at all) is not yet known. However, any that do join will be required to introduce the euro, if they meet the convergence criteria. Adam, you are right. One can belong to Europe without adopting the Euro. When I read websites concerning the collapse after peak oil, peak resources etc., the people usually write about the food production as the main problem. But there is one even bigger problem: clothes and shoes. Today, many of the former industrial countries are totally dependent on the clothes and shoes from countries like China, Bangladesh, Vietnam etc. Many former industrial nations do not experience any problems regarding the self-sufficiency in food. But almost all of them are not self-sufficient regarding the clothes and shoes. How much agricultural land would be needed to provide clothes for todays population? Our todays high-tech clothes have features that the clothes of the previous non-industrial centuries did not have. The lower quality clothes would completely change are attitudes, habits, lifestyles, work, roles etc. Has anybody tried to analyze this special particular post-collapse problem? As someone who used to live in St. Louis (First in Shoes; First in Beer; Last in the American League (baseball)), I think about shoes. The US is doing fine with beer and can do without baseball. One of James Howard Kunstler’s novels deals with the shoe issue. People make sandals out of old tires. If you look at accurate historical pictures of Native Americans, you see that their foot ware was pretty primitive. Europeans seemed to wrap their feet up with rags. I can see many years of scavenging clothing, but shoes need to fit. So I think foot ware is an issue. Unless you live in an area with frequent sub-zero weather, you do not need shoes to survive. I’m in the Pacific Northwest, and there’s a guy here who never wears shoes. Walks around barefoot everywhere. Rides a kayak into town to minimize time walking on asphalt. It is not ideal, but it is possible. In colder climates, boots are obviously necessary. Once people move out of cities into the country side, boots and shoes wear out much slower on grass and dirt than on cement and asphalt. The rest of clothes mostly wear out due to using mechanical washer and dryer combos. Hang drying clothes, which will be a necessity anyways, will greatly extend clothing life. Washing clothes less frequently also helps; there are many people who believe blue jeans should never be washed, for example. I live in the area close to the Czech town Zlin, where the Bata shoes empire originated (http://en.wikipedia.org/wiki/Bata_Shoes) and at the same time in the area of the former heart of the Slovak textile industry. I see the trend of lower and lower quality as regards especially the clothes: not so long ago the most renown world brands relocated their production to cheaper countries in order to keep the costs down. And preserve the quality. Now, even those most famous world brands are not able to produce the same good quality as before. Probably, the rising wages in the new, now already formerly cheaper countries (and other costs, too) force them to economize. When you want some sturdy clothes, you have to pay more and more. What you get in the shopping centers are clothes which are mostly for “puppets”, not for real people, as these clothes are less and less durable, made from ever thinner materials. These clothes are more and more for image, but not for real life. As regards the shoes, finding a good pair of sturdy shoes with modest look in those shopping centers is not always possible. E.g. ten or fifteen years ago you had no problem buying sturdy leasure shoes sold by some of the world sportwear brands that were made from artificial leather of good thicknes. Now you get leasure shoes that are mostly made from thinner and thinner materials or the artificial leather is replaced by plastics. This move from leather, through artificial leather to plastics is the move to lower and lower quality. After food, clothing needs to be the #2 concern as we enter a post collapse world. So we are going to live in a world where we wear tire tread strapped to our feet and farm with wooden sticks. Not many of us would survive such a world. John L Casey says that we are entering a new solar minimum, to reach it’s coldest about 2030 at the same time that oil runs out. In 2030 we will be wearing tire treads on our feet, farming with sticks, have no oil and living in the coldest climate of the last 200 years in isolated small economic communities. Many will die. I understand that in Norway, getting good enough foot ware to withstand the cold was a problem. Just a layer of animal skins was not enough to keep out the cold. According to the IMF, China is now officially the world’s largest economy, when measured by Purchasing Power Parity, which is apparently the state of the art in measuring economies. http://peakoil.com/consumption/its-official-america-is-now-no-2 We have just driven Russia and it’s large oil and natural gas supply into the China, Asia camp. JMG calls the rulers of declining empires ‘The Senility of the Elites.’ The rulers in the state department and pentagon are operating by questionable motives. It would doubtless comer as a shock to the two authors, but such ‘special-purpose crops’ were invented long ago by Mother Nature. Perennial grasses fit the bill nicely. They sequestered enormous amounts of carbon as they built the topsoil that we call the Midwest. Human have used various methods to release the carbon from the soil and put it into the air. We know how to put it back in the soil. The problem is, the method isn’t patentable. So Google couldn’t make a lot of money doing it. He just hits the subject a glancing blow, and indicates that ‘serious people’ are not interested in some solution which involves a bunch of farmers doing the right thing. Serious People are interested in proprietary solutions surrounded by patents which can be turned into money by giant corporations. First, a thought experiment. The Ogallala irrigated lands should not be producing corn ethanol, for all the reasons that have been discussed here. They should be returned to grasslands, and would be ideal for growing the perennial grasses which sequester the carbon. They need to be grazed by cattle, because grass and herbivores have co-evolved. The areas of the Midwest which get adequate rainfall need to be producing human food rather than the corn and beans which are used by confined animal feeding operations. That doesn’t mean that there will be zero animals on that land. More likely, it will be an integrated crop and animal rotation. These integrated rotations are the kinds of farming which were studied by the decade long Iowa State trials. The kinds of farming which produced the Dust Bowl should be way back in the rear view mirror. We now know how to farm flat land to produce crops sustainably. Hilly land in the well-watered parts of the country should be either grassland with grazing animals or forests. I recently quoted the statistic that the green leaves of cowpeas produce 9 times the calories (and many times the protein and micronutrients) as the seed: black eyed peas. The grains or beans that we prefer to harvest are an order of magnitude less efficient in their use of sunlight. David Kennedy’s books reflect the lessons he has learned over many years of his own land in Kentucky and his 40 years of experience working with very poor people in the South. Bill Clinton, reflecting on the work of his foundation in Africa, ruefully commented that it isn’t so much the ability to grow food as it is the ability of the richest billion to hijack all the land to grow biofuels and, thus, starve the poorest billion. Love your sentence about the “serious people”, spot on. Re your conclusion (Clinton’s (??) comment about BigAg hijacking land for biofuels) I’m preparing a short summary with a few figures about landgrabbing, that I’ll post here soon. Somehow, the whole idea of “renewables” and how we can save ourselves with them, has been highjacked into a way corporations can get rich, and the rich world can have more. The great plains and perennial grasslands were only a healthy ecosystem with the interaction of millions of herbivores (bison) that churned up the soil and recycled nutrients via their manure. No, that is not what they said at all. They concluded that, even if renewables could be brought down to the price of coal, it would not solve carbon emissions. The reason is that the existing coal plants would keep running; the only way it could work is if renewables were so cheap, they drove coal plants out of business. They then go on to state the current technology cannot achieve that goal, and they recommend power companies investing along the Google model, to accelerate innovation. Basically, they are technotopian and believe the technological singularity will save us. Of course, most of the “green activists” or whatever they call themselves, instead of trying to make more affordable renewables, want to simply tax coal up to the price of renewables. Joe Romm recently wrote an article saying that no serious people think that solar or wind electricity can be produced at a low enough price to drive a coal fired power plant out of business. He refers back to his work in government. Silicon Valley, and Google in particular, like to use the word ‘disruptive’…completely change the landscape. The two Google engineers end with a call for the energy industry to invest in Disruptive Research. Yet Robert Rapier wrote an article prompted by the bankruptcy of a Silicon Valley backed biofuels company, pointing out that the energy industry is a very well expolored territory. Exxon and Shell are not stupid. They have invested money and, mostly, pulled out. Rapier argues that Silicon Valley is a victim of its own hubris, and overreliance on slogans such as ‘disruptive change’.